You are here: Home / Ent. / Jaden Smith is the Face of a Louis Vuitton Women’s Clothing Line. Jaden Smith is the Face of a Louis Vuitton Women’s Clothing Line. (ThyBlackMan.com) What does this mean for Black Masculinity? The emasculation of the black male in this country has been an ongoing issue since slavery. Black men fight to have their manhood acknowledged in their community amongst their women and children. However, the argument of such in white America is another animal. When black men were lynched they were often castrated which was a direct attack on their manhood. In 2016 we don’t see a physical castration, but some can argue the symbolism of such things are still prevalent. The killing of black men by police and each other screams there is a lack of value for the life of these brothers. While we are concerned about their physical wellbeing one much also be concerned about the image of black males when the question of gender is on the table. We are seeing young black boys drink the poisoned Kool-Aid that says I can dress like a girl and it’s cool. Who determines what it means to be a man? Women wear different men’s clothing for comfort…why can’t I wear a skirt or dress? Jaden Smith was recently named the face of a Louis Vuitton WOMEN’S Clothing line. Now I must be honest…my first thought was why would I want to buy clothes, as a women, when the face of line is a MAN. Men and women are not build the same. I’d be concerned that the clothes were more tailored to a male form: no breasts, curves, hips…none of that. I could be wrong, but I’ve never seen the face of a male clothing line, no matter how many feminine undertones may have existed, be branded by a woman. Maybe the line is unisex you say…no it’s a women’s line distinctly and the face of it is a BLACK MALE. Once I got over my questions as a woman I began to look at the larger issue: down low emasculation. I respect that Jaden Smith, and his sister Willow, question gender roles stating: “They don’t want to do this because of this… or ‘I don’t want to wear this because I have a boy or I’m a girl and I need to act this type of way. Nobody every thinks, ‘Yo, who made all these rules? Who was here and who made these rules because I’m equally as smart as you.” I understand Jaden is smart, however he doesn’t seem to realize that he has been used. In wanting to live outside of societal constructs in what seems to be an attempt to be free he’s been branded the face of a Women’s line…yes used to represent the opposite of man. What white boy was in the ad with him wearing women’s clothes…there was none…how interesting. The big picture is not just that a male is the face of Louis Vuitton’s women’s line, but also that it is not a white male nor any other ethnicity. This line is branded by a black male…what does that say for the manhood of our young men? We are already battling the “thug” image…must our young boys also be labeled women? This is not a question of sexuality, but masculine identity for black men in this country. Jaden’s position was used against him and he appears to be oblivious to it. To clear up the confusion many on different sites have mentioned that kilts are manly. Yes, they are a part of a specific culture…it’s not the same as a blatant skirt or dress. It is very ironic that a 17 yr old white boy was not chosen nor in the ads for this line. Yes, they can be free thinkers too, but Louis Vuitton did not brand a women’s line with a WHITE MALE…some could argue they know better. Some would question has Will Smith, a black man and father, allowed too much free thought without expressing the consequences or danger of such. Will Smith has never, and will never, be the face of a women’s clothing line. Will is rather aware of the state of blacks in America, and to the eye his masculinity is intact. Why then allow ones son to be the poster child for sub conscious emasculation? Willow Smith is not the face of a male clothing line…so why was this ok for her brother. As the mother of a little black boy I won’t judge a household I do not live in. However, my husband would not allow our son to walk about in a skirt nor a dress. He will be taught to be aware of who he is, and yes be an open minded thinker…but not at the expense of your masculinity. Bullets are not the only way to disenfranchise young black boys. We must be willing to protect the image and manhood of our young boys if we intend to fight for our community. Again, this is not an issue of sexuality…but masculinity. White boys are not having their masculinity exploited by doing things such as being the face of, and wearing, women clothes. It’s one thing to cross dress, and another to have your face labeled as that of an entire line of the opposite gender. The soul, mind and spirit of our young men must be protected by fathers, mothers, and community. We must educate them about the difference between free thinking and exploitation because others will not teach them that lesson. I look forward to seeing Jaden Smith play the DC character Static Shock, as well as watching how his ideas develop as he gets older. However, I truly do believe this Louis Vuitton women’s line has deeper implications then he understands as the war to save our children is underway. People try so hard to be gender blind or color blind, wanting to pretend those differences doesn’t exist. The fact is, they do. In this i’m not promoting racism or sexism, but merely saying that those differences shouldn’t be regarded as a cultural gap, but of something to celebrate. 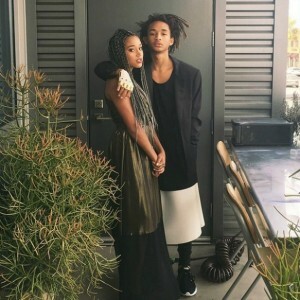 Jaden might be trying for equality, thinking that there shouldn’t be differences between women’s dress and men’s dress, but, well, I think the differences between women’s dress and men’s dress is beautiful. This is awesome, Jaden. Future-sighted.